Can I let you in on a little secret? If you haven’t seen Kurt Gunn perform (and you probably haven’t) you’re missing out. Although he’s a respected veteran of the local music scene, for this performer, many nights the crowd is thin. Well, ‘crowd’ might not be the right word. 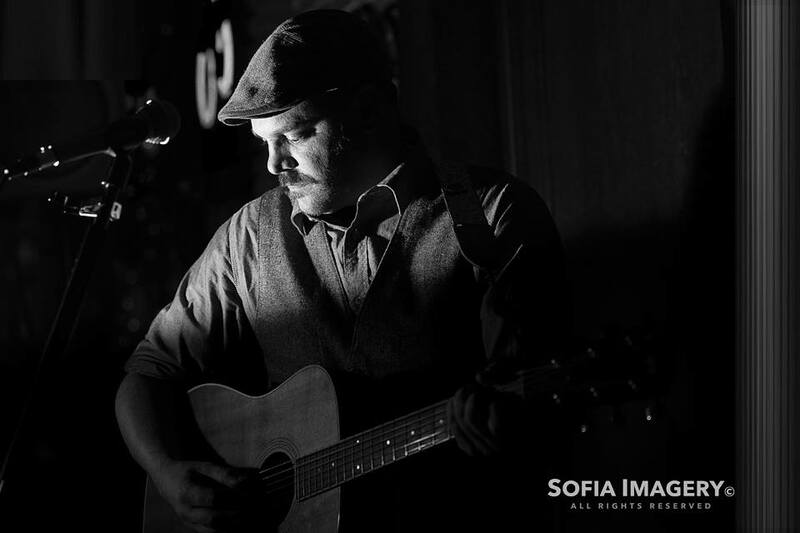 He’s been writing original music for years and has hundreds of his own songs, but it can be hard to stand out in Green Bay’s music scene when you rarely play covers, and you can only gig a few times a month – mostly on weeknights. Kurt’s passion for music arrived in the form of the Beatles’ song Dear Prudence. Kurt was about eight years old when he first heard the song in his parents’ basement and got hooked on the tune and music in general. That song was the first thing we talked about after we sat down for coffee at the Jitter Bean coffee shop. His intense connection to the song compelled me to listen to it with new ears. Listening to Dear Prudence, you can easily imagine an eight-year-old flipping through his parents’ albums in the 80s, discovering the Beatles’ White Album, gently pulling one of the two albums from its album jacket, and putting it on his parents’ basement turntable. He listened to it repeatedly. Kurt didn’t understand the song, but it resonated with him. “But yeah, that song and the Beatles, I mean, that was it,” he says. After chatting with Kurt about this “bullet point” in life, it started to feel less like an interview and more like a coffeehouse chat. With a dry, self-deprecating sense of humor, the guy is a storyteller, whether it’s in song or not. His story started with Dear Prudence at eight years old, but it wasn’t until high school that his friend, Brad (a brand new guitar player himself) taught him a few guitar chords. Another friend gave him a guitar. He continued learning to play with tablature. Like many young musicians back in the day, he spent his paper route money on an electric guitar and an amp (a Fender Princeton Chorus) and spent hours practicing in his room. He wasn’t serious about guitar or performing yet, but he and his high school friends were already writing original songs with those newly mastered three chords. Fast forward a few years and we find Kurt in the Razz Ma Tazz bar just off of Main Street, on the East side of Green Bay. It’s where he and his buddies first started performing. It’s also where Kurt found a mentor of sorts. Jim “Soup” Campbell played acoustic music at “The Razz” when Kurt and his friends started hanging out there. They’d watch him perform, hanging around looking for an opening. Eventually, Soup invited them to play on stage with him; soon they started playing open mic there. Then they started filling in for Soup. The Razz started having them perform. And ultimately, it was Soup who laid the way for their gigs outside of the Razz at some of Green Bay’s bars downtown. Things came together and Kurt and his friends put together a band, Commonplace. They played bars in downtown Green Bay like Kittner’s, Oxford’s and Brewbaker’s. Hanging with friends, free drinks and getting paid to play made it pretty appealing for guys in their 20s. But when Commonplace eventually fell apart Kurt tried a new approach to original music; supporting it. Kurt’s not afraid to try stuff out, especially if it’s related to original music. He started the Wisconsin Songwriters Revival. Here’s how that movement described its mission.. It was an effort to promote the many under-known Wisconsin artists writing original songs. The revival ran about a year at Montague’s in De Pere. On Wednesday nights, Kurt and Brad kicked off an all-original acoustic music night with a set of their own original songs. The second set would feature another Wisconsin artist and the final set would be the headline artist. But in Gunn’s words, “That did not go well either.” It just didn’t catch on. He tried something similar at Pi Nightclub downtown. He was booking incredible Wisconsin talent for solo acoustic gigs and no one would show up. Deflating? Discouraging? Definitely a downer. Once again, Kurt was scratching his head and wondering what happened to Green Bay’s appreciation for original music. Commonplace breaking up also led to Kurt playing solo acoustic. These days he still plays with his band, Painters’ Light and other local musicians, but it seems like he’s playing more and more on his own. In fact, he released his solo album, Underneath, in October. He’s a storyteller and his laid-back personality comes through stronger than ever in his music and on his Facebook page. It’s hard to get the word out to let Green Bay know what they’re missing. Kurt’s day job makes booking gigs hard. His schedule as a Green Bay firefighter, working lots of weekends, means limited booking opportunities. Limited booking opportunities means limited exposure. And this is a man unlikely to brag himself up. Kurt seemed determined to convince me he’s nothing special, ordinary. He’s almost certainly convinced himself, but a man who works so hard to create, produce and support original content is clearly an original himself. At the end of our interview, Kurt half joked about being like Charlie Brown, but I think he’s more like Clark Kent. Green Bay just doesn’t know he’s Superman yet. Kurt Gunn released his album, Underneath, in October. Find his music on ReverbNation and his website. There is a female singer singing some of the wfrv commercials I like her sound. I’m wondering who she is and if she has music available? Tony, I know the commercial you are talking about, but I have no idea. You’ll have to contact WFRV. Kurt has a great voice!